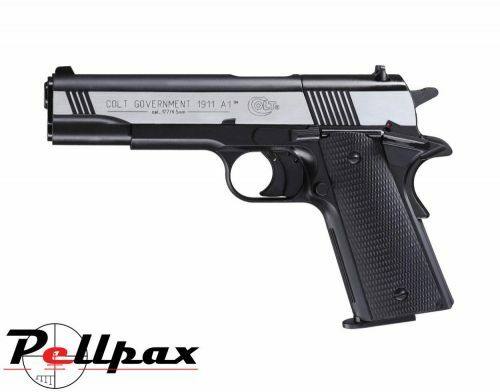 This awesome model of the Colt 1911 is made by Umarex under license from Colt so everything about this pistol is just as it would be on the real thing. The pistol grip has the authentic grip safety just as the real model so at times it is hard to tell the two apart. The pistol has a full metal frame with all metal working parts which not only makes it a great pistol to handle and shoot, but that is backed up by a smooth and precise action that will last for years to come. The pellets are loaded into the 8 shot rotary magazine which then fires them down the rifled steel barrel which ensures fantastic accuracy and precision on each shot. The CO2 capsule is housed within the grip and is loaded with a tool free cam system for quick and easy reloading. Pistol comes complete with 2 x 8 shot magazines all housed in a hard case.